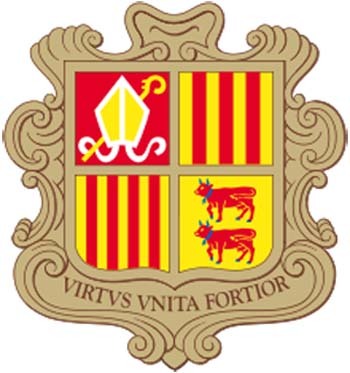 Discover the Coat of Arms of Andorra. The coat of arms of Andorra, as the flag, are the official symbols of the Principality of Andorra and are considered in the Constitution. The coat of arms is divided in four areas, the first with a golden stick and a miter; the second with three bars of red representing the county of Foix; the third with four red sticks representing the Royal Sign of Aragon, and the fourth with two red cows facing each other, with horns, collar, and claws in blue honoring the County of Bearne. The official design is shown on parchment and sometimes also framed by noble symbols such as capes or crowns.